One of the most famous and beloved baseball legends of all times is Mickey Mantle. Many books and articles have been written about the sports hero. In his book, Mickey Mantle, Rookie in Pinstripes, author Fred Glueckstein, delivers an in-depth account of Mickey Mantle’s life covering his early life to his 1951 rookie year. Glueckstein presents a comprehensive story of how events in Mickey’s young life, particularly his relationship with his father, early teammates and coaches, as well as significant incidents that influenced and shaped him to become a baseball legend. Glueckstein chronicles his childhood as a “shy youngster with blond hair and freckles from rural Oklahoma.” Raised in a family with a strong work ethic, readers will gain insight into the deep connection Mickey had with his father and the trials and tribulations he faced and conquered. Not only do we gain insight into his personal struggles, Glueckstein also shares the influences of such baseball greats as Yogi Berra, Hank Bauer and Phil Rizzuto. Memorable events such as meeting Joe DiMaggio were both emotional and inspiring: “With Joe DiMaggio, I couldn’t even mumble hello. It was as if you needed an appointment just to approach him.” As well, readers will discover how other baseball legends felt about Mickey. Along with a very detailed account of Mickey’s childhood and rookie year, Glueckstein is able to capture the excitement of the era making one feel as though they are reliving legendary moments in baseball history. What makes the story such a fascinating and compelling read, is how much research went into writing the book which includes documented conversations, letters, pictures of Mickey during childhood, and baseball stats. The book is skillfully crafted to allow readers to see a personal side of Mickey that was burdened with such struggles as personal loss, overcoming weaknesses in terms of playing performance, and the pain endured from physical injuries. Readers will gain a candid look into how the baseball legend was made with the strong influence of his father shaping his determination, resolve, dedication, and the love of the game. It is an inspiring story of never giving up on a dream. Mickey Mantle is highly recommended not only to baseball fans, but to readers who enjoy stories about sports legends that understood that the driving force for success wasn’t fame or fortune, but the true love of the game. Today it is common to turn on the news and hear stories about massive layoffs and corporate downsizing. With the increase in living costs and an unpredictable economy, more people are finding it difficult to make ends meet. Many people are now considering starting a small business. 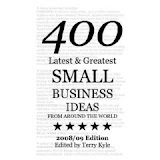 In his new book, 400 Latest & Greatest Small Business Ideas From Around The World: 2008/2009 Edition, Terry Kyle presents a comprehensive guide for people considering starting a small business as well as those who already have their own business. Whether it is a full time endeavor or part time project to bring in extra income, readers will find this extensive small business guide to be a valued asset. Kyle delivers an in- depth analysis of starting a small business. The guide is more than a list of the latest and greatest small business ideas. It gives a detailed account to budding entrepreneurs regarding the tools and skills required to make a small business a success. A fundamental message Kyle imparts is that “the key difference between a great idea and a killer small business is action.” That is, you must have the “will” to act. Kyle provides thorough and constructive tips that will help you chart your own entrepreneurial destiny. He teaches readers how to avoid taking a financial risk, how to minimize costs that include making the most from your advertising budget, minimizing overhead, how to get you idea and message to the public, and strategies on how to work with clients, staff, and creditors. He delivers the best attributes for a successful small business. The book will give small business owners the tactics to gain a competitive edge. As well, there is an extensive list of 400 of the latest and greatest small business ideas that include the strengths and weaknesses of each. Small business ideas such as the customizable “My Monopoly Game,” are creative, unique, and imaginative. As well as providing simple small business etiquette rules, many inspiring quotes such as “It’s not what you sell that matters. It’s how you sell it,” and “profitability keeps business alive, not mere sales,” will inspire people who are determined to succeed. In today’s world, war, violence, poverty, disease, starvation, and oppression, have become an unspoken accepted reality. These were issues that Liberals once fought to overcome. In his book, What the Hell is a Liberal? author David Truskoff presents a candid look at how liberalism has been successfully minimized by the powerful political “right.” The rich are getting richer. The growing gap between the “haves” and “have nots” is increasing, and our natural resources are being rapidly depleted. The term “Liberalism,” is defined as equality for all that includes such aspects as engaging diplomacy instead of choosing war to resolve political turmoil, ending poverty, promoting free governments, advocating education and affordable healthcare…etc. Truskoff has been an active participant and witness to Liberal struggles such as the impact of Dr. Martin Luther King. Truskoff provides an in-depth account of the evolution of the relationship of the US with other foreign powers, particularly the US and Israel partnership. As well, he chronicles the influence of powerful lobby groups such as the American Israel Political Action Committee, one of the most powerful lobby groups in Washington. 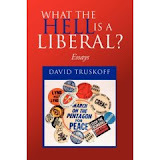 Delivered as a well-plotted series of essays, Truskoff is able to chronicle how the evolution of the Right has successfully exploited and depicted Liberalism as a negative philosophy to mainstream society. The book is not presented as completely anti right as he notes a number of high profile figures on the left who have abandoned key principles of Liberalism for their own agenda. Truskoff points to Senator Joe Lieberman as one important example of abandoning one’s principles and ethics. He discusses Palestine, without supporting the acts of terrorism, but the apartheid type conditions the citizens of Palestine live in. Fundamental themes that emerge throughout the book are how the greed and indifference of a select elite, with the help of the media, have been able to successfully change the dynamics of the world to everything Dr. Martin Luther King struggled against. That is, there are people in the world that are now considered disposable and military colonization has become an accepted method of resolving conflicts. Survival of the richest is now defined by Military Might. Truskoff writes with clarity, having witnessed the decline of liberalism and the rise of capitalism without compassion, morality, and ethics. It is a very well researched and well written book that acknowledges this new breed of capitalism that seems unstoppable. Truskoff explains that it is not and writes with hope. He points to our own need to learn from the past so that we can go forward and adopt liberal ideas that seem to have been lost over the years. What The Hell Is A Liberal? is an engaging and compelling read meant to open our eyes to our past, present, and future. Whether you agree or disagree with arguments made in the book, it will definitely make you think and hopefully start a dialogue with others. It is a must read for anyone concerned about the future of humanity. In Memoirs of my Grandmother, author Lynn Pinkham shares a personal and spiritual story of her Grandmother, Agnes Sevey. For Pinkham, her grandmother, whom she lovingly refers to as Grammy, is one of the most spiritual and profound influences on her life. Grammy was a deeply spiritual Christian who applied the Word of God to everyday problems. Pinkham’s story evolved from the personal notes and comments Grammy made beside various passages in the Bible. Pinkham is able to integrate the passages by incorporating them into a story on how to live a spiritual and righteous life. The anecdotes and passages are not only designed to help readers embrace the Lord, but to apply spiritual principles and metaphors to the trial and tribulations we face in daily life. The story is presented in a number of chapters that balance teachings of the Bible with everyday problems. This includes: financial hardships, addictions, mental illness, coping with loss, and finding spiritual solutions to overcome life’s sudden knocks. Such metaphorical anecdotes include our relationship with the natural world, gardening, and cooking, which contrasts and emphasizes our spiritual well being as well as our mental health. Fundamental themes include: accepting and understanding our spiritual connection with the Lord and overcoming such difficulties as doubt and forgiveness. With the quoted Bible passages enhancing each anecdote, Pinkham is able to convey a spiritual healing process that we can all embrace. One notable story is when Grammy was knitting mittens. She tells young Pinkham: “I am transforming this skein of yarn into something useful and beautiful. It is important that we become like this yarn in the hands of God so that he can transfer us into something useful and beautiful.” The book is filled with wonderful anecdotal stories rooted in strong spiritual messages. Pinkham depicts Grammy as a peaceful and spiritual woman with a strong Christian faith. Because the stories are so personal, readers will feel as though they are sharing in Grammy’s wisdom. Memoirs of my Grandmother is a must read for those who enjoy spiritual wisdom that can be applied to everyday life. It is highly recommended as not only a compelling memoir, but also as a spiritual self-help guide.